Ceramic braces are less visible than traditional braces, and offer a more esthetic approach to orthodontic treatment. 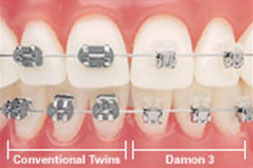 For that reason, ceramic braces are usually used on older teenagers and adults who have cosmetic concerns. Self ligating braces are a relatively new appliance system for straightening teeth that has several benefits over traditional braces. The bracket is uniquely designed to allow lighter forces on the teeth and periodontium, due to very little friction between the braces and wires. This lower friction allows for a gentler force for tooth movement, possibly faster treatment times, fewer office visits, and has some oral hygiene benefits as well. Invisalign uses a series of invisible, removable and comfortable aligners to straighten your teeth. And, no one can tell you are wearing Invisalign because they're virtually invisible! Not only are the aligners invisible, they are removable so you can eat and drink what you want while in treatment, plus brushing and flossing are less of a hassle. The aligners are comfortable and have no metal to cause mouth abrasions during treatment.